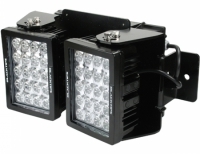 Blacktip LED work lights are industrial strength and engineered to meet the need for very high quality, durability work lights for industrial and commercial markets. In short, these lights are virtually indestructible and more efficient and effective (lumens/watt) than all other lights on the market. We use the latest CREE LED technology to produce the highest lumens/watt in the industry and combine that with our super flexible and patented mounting system to offer a versatile light, easy to mount and easy to adjust. Each light now includes our standard marine grade anti-corrosive coating to protect the lights from water damage or incursion. The lights and electronics are protected against voltage spikes, overheating (ETM thermal management) and accidental reverse polarity installations. Blacktip lights have been vibration tested to 21 Grms and have a Cisper 25 class 1 rated which means no radio interference or “buzzing”. Blacktip LED work lights are available in six different beam patterns so from spot beam to wide flood, we have your lighting needs covered. IP69 Rated means no dust or water incursion.